Some still attribute “structure” to an old school model. “My child needs structure” could be translated to ….what? I believe that there is a misconception here. Can any teacher teach without structure? I do not think so. Can one coach and guide 25-30 students without an explicit underlying structure? I can proclaim, that my new environment would not function without very carefully planned and practiced structure, which is explicitly taught, practiced and revisited. So, what is the structure some folks are wanting? One hears and reads proclamations that the teacher of today should not be the “sage on the stage” or the controller; however, the teacher of today still has to manage a group of students, and when they are in the primary grades, even more so. However, what those students are doing and how they are interacting is very different in a modern environment. So, I am wanting to shake up this word structure. What are folks meaning by a “structured” environment these days? What does it really mean? Are we using it to clutch to our old comfy paradigm? Is a class that has moved away from the industrial revolution’s paradigm of teacher controlled environments equal to a class lacking in structure? 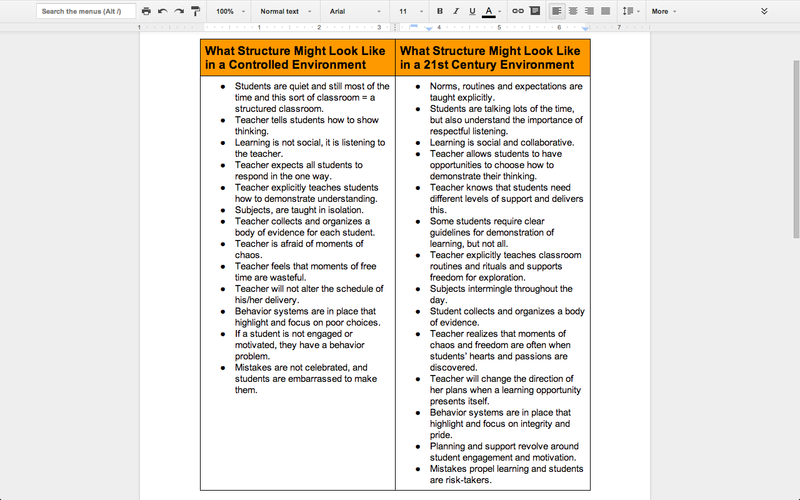 What is your thinking about structure in a modern classroom? When kids move and talk does that mean the environment is not structured? What are your thoughts? As I read your post, I couldn’t help reflect on those feeling I had last year, and requested the structure on the left hand side, while I as an educator believe completely on the philosophy on the right hand side. Why would I want the change. As a parent we are often left out of the communication component of an educational philosophy so we only have our “educational” experience often times in very rigid structure environments. Our children leave our homes to what I refer to as the black hole of education today. We get only get a glimpse of what is happening at school through “Thursday folders”, parent conferences, and an event or two that occurs at school. If you are lucky parent who is allowed to volunteer and be apart of things you might get a closer look at your child’s day. Conference and report cards today are based primarily on assessments, we get our kids test scores, AIMSWEB MAP, TCAP, DRA, and are shown a writing sample, perhaps a math test, but basically we don’t see the “21st Century” component of education. So… we go back to our childhood, and what we know and it’s the “traditional learning styles”. There seems to be a lack of evidence of school work shown for 21st Century learning. We are having to trust our teacher’s evaluation how our children are learning and doing. I find myself as an educated parent wondering what is going on all day at school. My child spends months on a project, but little evidence of a final product and what have they learned. Example was a project on a country, and if you ask questions, the learning was very shallow and made little connection to their lives and lacked a purpose. Recently, they work on a mini-society and a collaboration project, and came home with a rubric, but nothing attached for a parent to understand why your children received the scores they received. There seems so much confusion at times with what was going on. I heard from a few parents it looked wonderful, but we weren’t allowed to see or be apart. Again… in the end if keeps you wondering. So… the request for structure is really a request for the known or knowledge. Parents understand the A, B, C, D, F grading system based off of percentages. But… being given only Educational scores from assessment given through out the year isn’t telling what our children are doing in school. If 21st education is to succeed, then bring in a portfolio, send us a flash drive of what our children are doing on computers, print out that presentation, start showing us the learning. My children attend a play based preschool where not one worksheet was ever given, however the teacher documented their year in photos and took antidotal records. The evidence was shown, and easy to be pleased as a parent that my children learned. Thank you for your response, Darene! You latter comments remind me exactly of Reggio Amelia practice—photos and anecdotal notes–however they usually have a ratio of 1 to 15 kids. Thanks for your opinions. It does have me wonder if class size is a barrier to this type of learning. Yes… my children attended a school based on Reggio Amelia practice, and they had 8 children their first year, and 12 children their second. Did make a huge difference. But, aren’t kids producing product on the ipads? Can’t they be apart of taking photo, printing things, etc… ?